What Will Customers Look Like in 2015? We know what customers look like right now – more integrated with social media, looking for a personalized, efficient shopping experience. With things changing as quickly as they are, have you thought ahead to what your customer will look like in 2015? It looks like folks have started thinking about this already. 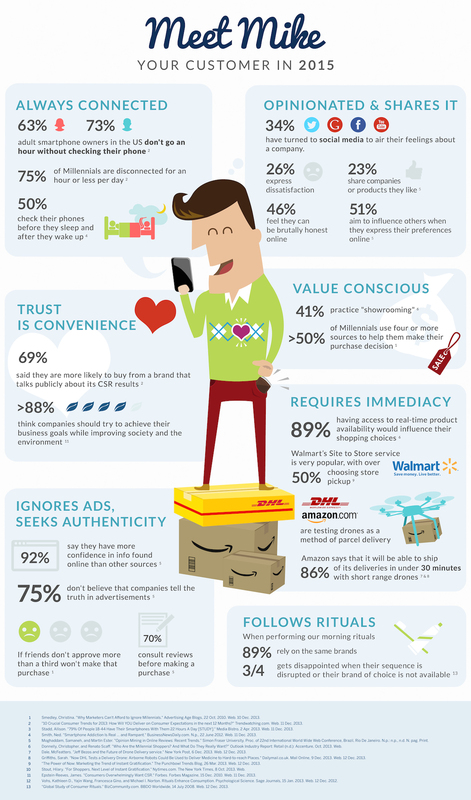 The infographic below shows some interesting predictive trends on the new face of the customer. Some of the most interesting statistics? 46% of respondents feel they can be brutally honest online. If that holds true, and the other statistics that say 70% of consumers read reviews before making a purchase, and a third of consumers will not make a purchase if their friends won’t approve, online conversations can go a long way in making or breaking a purchase decision. This trend has been on the upswing, with consumers being more honest and comfortable sharing their opinions on social sites versus sharing that information directly with companies via online satisfaction surveys. While people still voice their opinions in the traditional sense, social media is slowing picking up steam. This is, in part, why companies are utilizing social media monitoring programs more vigorously than they used to. 69% of consumers say they are more likely to do business with companies who share the results of their customer satisfaction surveys. This may be another layer of security when deciding on making a purchase – if reviews in social media are positive, and the company boasts strong loyalty and satisfaction, it could be a tipping point. Conversely, if companies don’t share this data, it may be perceived by consumers that they don’t ask for consumer opinions, the data is not positive, or they capture the data but don’t care enough to share the results. It’s unclear of course, what consumers are thinking, but these are some reasons why it’s a good idea to share those statistics with consumers. 89% of respondents say that real-time product availability information makes an impact on their decisions. Making sure websites are providing real time product information will go a long way in ensuring consumers purchase from your company over the competitors. Take a look at the infographic below and share your thoughts on a key takeaway. What surprises you, or what do you think will not be likely a year from now when it comes to consumers? Comment below and join the conversation! Ann Michaels & Associates | Comments Off on What Will Customers Look Like in 2015?